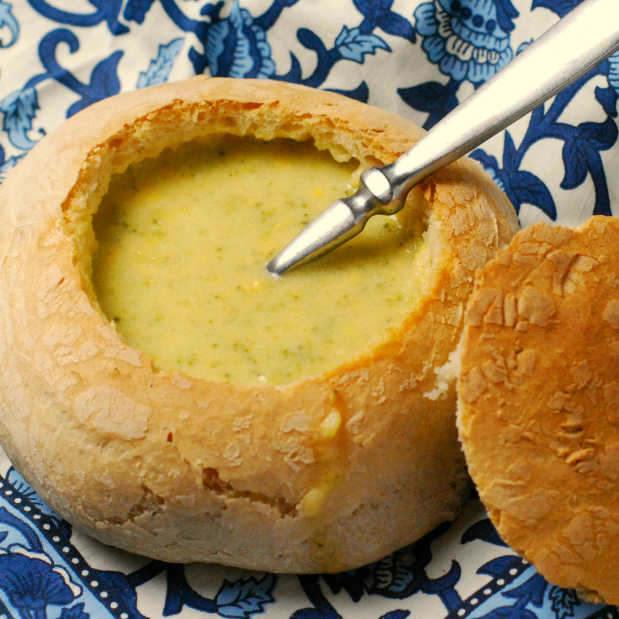 This homemade bread bowl recipe is perfect for eating soup on a cold winter day. 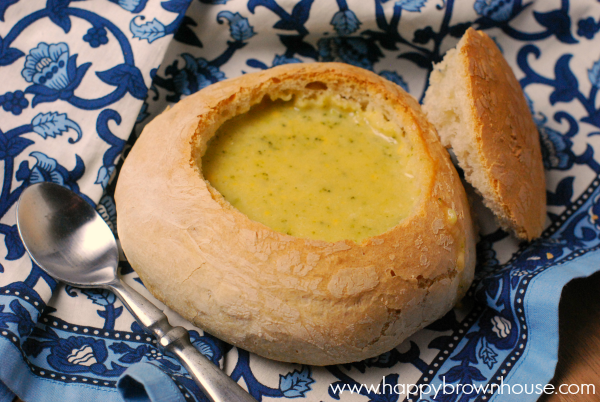 I love to eat Broccoli Cheese Soup out of homemade bread bowls. They just scream comfort food. It truly is a complete meal. No need to dirty up a bowl when you can eat it instead. Plus, it’s a little bit fancy. Right after my youngest was born I decided to make bread bowls. I vividly remember baby-wearing and making bread bowls while I healed from my c-section. 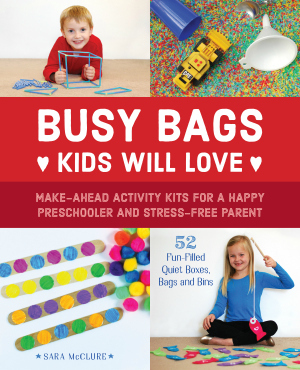 While this might sound a little ambitious for a mom with a newborn, it really wasn’t that hard. They did take some time, but any homemade bread takes time to make. I was super proud of my efforts and lived to tell about it. Maybe you’re like me and love to eat bread bowls. Or, maybe you want to make dinner a tad bit fancier to impress your mother-in-law. Either way, these bread bowls make the perfect addition to soup night. These bread bowls are best with creamy soups, not thin soups. So, potato soup or Broccoli Cheese Soup are perfect for them. Really watery soups like my Crockpot Chicken Tortilla Soup don’t work as well with bread bowls. If you’ve never made bread before, you’ll need to know that you should place the dough in a warm place to rise. I usually turn on my oven for a little bit and place the dough on the top of our flat cooktop stove because it gets warm there. Cover it up with a towel to let it do its thing. When you are finished baking the bread bowls from scratch, you’ll need to pull some of the bread out of the middle to make the actual bowl part of the bread bowl. Cut a small circle in the top off of a bread bowl and scoop some of the bread in the middle out. We like to use this bread to dip into our soup. 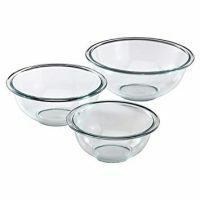 If you crowd your bread bowls like I did (pictured below), you’ll need to be careful when you pull the extra bread out of the middle of the bowl. If you pull too much bread out of the middle, you’ll have a weak bread bowl wall that will leak soup out of the side. Ask me how I know…ahem. 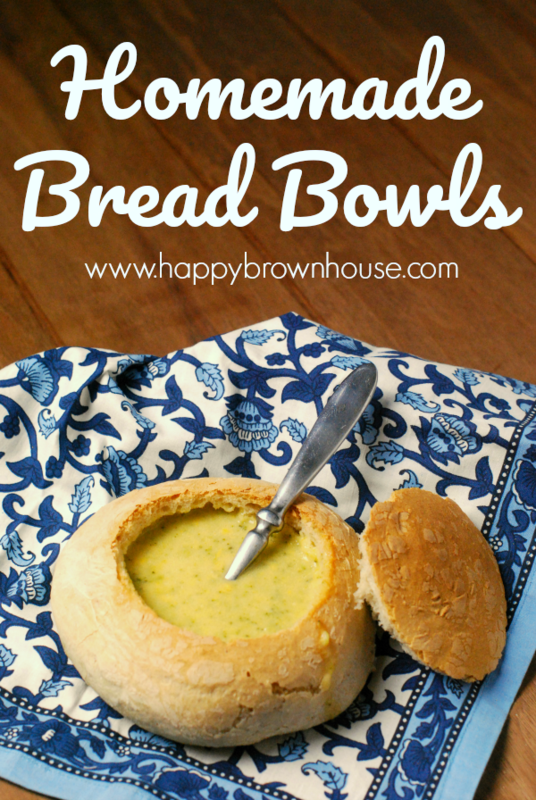 Impress your guests or spoil your family with these yummy bread bowls perfect for creamy soup. These will make soup night a tad bit fancier. 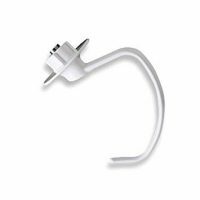 In a large bowl (or a bowl of an electric mixer), dissolve yeast in warm water. Let stand until creamy (about 10 minutes)--you can omit this step if using instant yeast. Add salt, oil and 4 cups flour to the yeast mixture; beat well. Stir in the remaining flour, 1/2 cup at a time, beating well with the dough hook of an electric mixer at medium speed after each addition until a soft dough is formed (you may not need to use all 7 cups). The dough should not be sticky. If it is, add more flour. 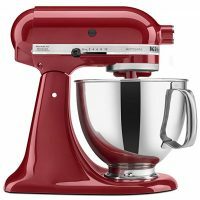 When the dough is formed, turn it out onto a lightly floured surface and knead until smooth and elastic (or let the dough hook of an electric stand mixer knead it). This should take about 5 minutes. Lightly oil a large bowl, place the dough in the bowl and turn to coat with oil. Cover with a damp cloth and let rise in a warm place until doubled in size (about 40 minutes). Punch dough down, and divide into 6-8 equal portions. Shape each portion into a round ball. 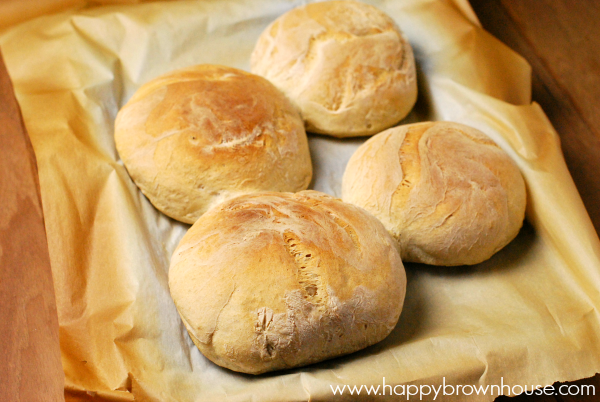 Place dough balls on a pan with a silpat liner or parchment paper. If you don't have either of these, you can sprinkle the pan with cornmeal. Cover and let rise in a warm place that is free from drafts until the dough balls are doubled in size (about 35 minutes). Preheat oven to 400 degrees. Bake in preheated oven for 15-18 minutes until golden brown and baked through. Nutrition information isn't always accurate.